Hotrods, customs, bands and a bank holiday Monday, what more do you want? Beer, windmills and cake in my case and not necessarily in that order but that was easily remedied, Faversham in Kent being the home to the Shepherds Neame brewery, brewers of spitfire my ale of choice on a Friday sufficed for the beer element, though as on bike I stuck to tea until home, windmills well Kent has lots and there are two either side of the town, sadly neither with sails but that will satisfy a Bosun and he even found them and the organiser had previously offered cake to tempt me to head to Kent result the recipe for a perfect day. The temptation it was later to be found to be just a sneaky carrot on a stick, as alas no cake, but them stumps was doing his best running around in circles mode looking for a lost PA delivery driver and going a delicate shade of lobster in the sun with a big grin on his face. 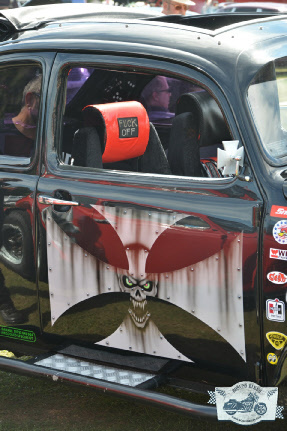 Chrome and Cruisers is now in its tenth year has steadily evolved from its early days at Sittingbourne racetrack to its now palatial home at Abbey School in Faversham but still enthusiastically promoted and organised by stumps. And this promotion worked as there were vehicles everywhere, despite great marshalling by the Rejects Brotherhood the fact there was only one entrance to the venue, filtering out show cars and general visitors cars and for some strange reason some large show cars leaving early it was inevitable that there would be some bottlenecks, English school entrances are not the right dimensions for yank motors. Well the easy answer to that is come on a bike worked for me. Eventually I escaped the Bike Park as that was almost a show in itself and found my way into the main show field having paid a fiver to get in. The show bikes were nicely set out on hard standing with some new bikes for me to gaze upon, and some funky smaller bikes, it seems the fad for these is still continuing. Along with several scooters one fan of siouxsie and the banshees had an amazing painted and chromed scooter called dazzle, which ultimately won best scooter. 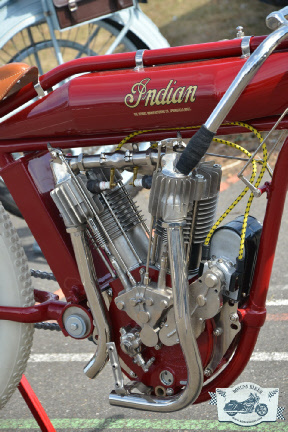 The mad blown Suzuki I spotted at an earlier show was still as mad as a box of frogs and the owner still had the same crazed grin despite nearly blowing up the engine once and blatting around all summer. With a few chops and classics there was a good mix. Oh and some err interesting trikes. The auto jumble stalls where you could pick up all sorts of car, bike, music and clothing parts were arranged all around the outside edge of the field, and then the various car clubs were arranged in groups across the field, and although we may go for bikes, it is interesting to see some of the customising ideas on some of the vans and other vehicles and whether they could equate to bikes. 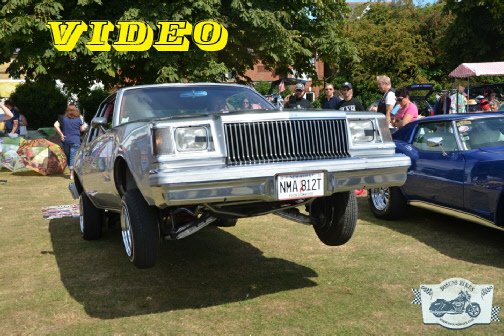 I also have a soft spot for the madness that is bouncing low rider cars pure lunacy. After the last few years where the weather has been against the event this year the sun was scorching, and the queues for drinks and ice-cream almost matched the queues for entrance and your erstwhile reporter was going lobster and headed off to find any shade.